Written and Media by Mitchell Hooten. 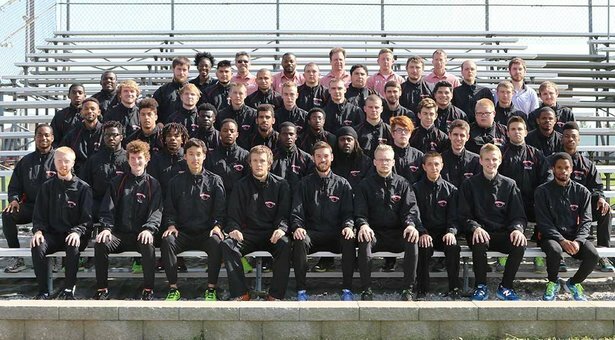 The Greenville Men’s track and field team recently traveled to Rose-Hulman Institute of Technology to participate in their Twilight Meet, which took place on Friday, April 2o. This meet has always been a great meet for the team to compete with great competition and there are always great performances that come from competing at Rose-Hulman. Even with the highly talented competition, the men’s team still provided a multitude of great performances. Some of the performances were even good enough to rank multiple athletes high on the Division III list. The number of top-notch performances was up to par with performances that would be achieved at a national competition. 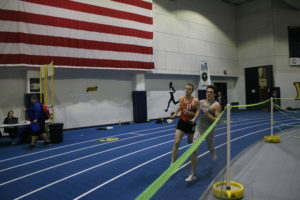 The best performance of the meet could have gone to many athletes, but the coach staff gave it to John Mangold on his record-setting 3000 meter-run. Mangold won the race in a time of 8:29.47, which broke a sixteen-year-old school record held by former Greenville standout Beau Meredith. On top of breaking the school record, Mangold also broke the stadium record at Rose-Hulman by twelve seconds. Another athlete that ran very well in the 3000-meter run is Dylan Goodyear, who finished in third-place in a time of 8:38.97, which also would have broken the stadium record. The other notable performances from meet came from the 800-meter crew of Andrew Sharp, Nathan Potts, and Jaylen Shelton who all ran season best times and placed very high. Sharp finished in first in a time of 1:52.16, which is the seventh best time in Division III so far this season. Potts came in fourth place in a time of 1:53.52 and Shelton finished seventh with a time of 1:54.98. The amount of times when a team has three runners under 1:55 usually means you have a group of fast runners. An athlete who had great performances in multiple events was Greg Mitchell, who placed first in two of his events and placed second in another one. The events that Mitchell placed first in was the high jump in which he jumped a height of 6′ 2.75″ and then in the long jump with a leap of 21′ 0.5″. His lone second place finish on the night came in the triple jump, where he leaped a distance of 44 feet, 4.75 inches. The last notable performances on the night came from the throwing events who competed what down the road from the track. Aside from the long distance from the running events, the throwers still competed very well. 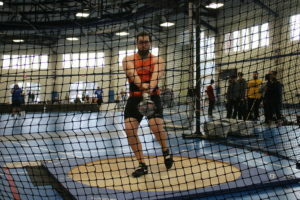 Two throwers placed in their events– Ben Perry finished third in the hammer throw with a huge personal best throw of 164′ 9″. Next was Mitchell Hooten, who placed fourth in the discus with a throw of 137′ 6″, which is a great throw for Hooten competing on an injured ankle. If you want to come watch the Panthers compete, then come cheer them on at the SLIAC/AMC Conference Championship this weekend, April 27-28 at home. Hello, my name is Mitchell Hooten and from Prairie du Rocher, IL. I'm a senior this year and I'm getting my degree in sports management. I've been a writer for the papyrus for the past year but writing specifically for the sports section. I hope that you will enjoy reading my articles this year.